On April 1, 1974, an intense low pressure system formed over the Plains and moved eastward toward the Mississippi and Ohio Valleys. Combined with a large mass of moist air, several tornadoes were spawned the South on April 1st and 2nd. At 9:40 p.m. on the 1st, an F3 tornado killed one and injured six in Huntsville. It was estimated to be 800 yards wide and travelled 8.4 miles. It tore down the WAAY AM 1550 tower. According to the Huntsville NWS, "this tornado moved NE, then SE across the western part of Huntsville. The Sherwood and Research Park sections suffered severe damage as homes were unroofed and walls were blown down. The casualties were in trailers north of Huntsville." 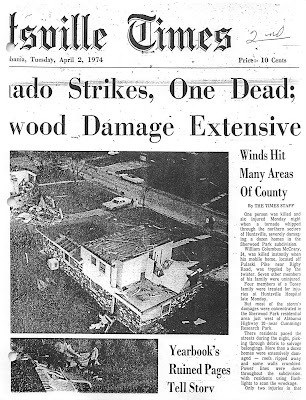 Very interesting, also very sad, considering that Huntsville would be revisited--not once, but TWICE--only 48 hours later, on April 3, 1974, courtesy of the Super Outbreak.